My favorite naked longganisa from Breakfast Bin can also be savored at their sister resto Oinkster, which is also along Maginhawa. Compared to Breakfast Bin's narrow interior, Oinkster's ambience is geometric-inspired, with prism lamps and pattern tiles. Their loft-type place can accommodate more people, which is ideal for us all-day-brekkie fans! As always, their naked longganisa does not disappoint. I always enjoy it with brown rice and coffee, making it my go-to afterburn meal on weekends. 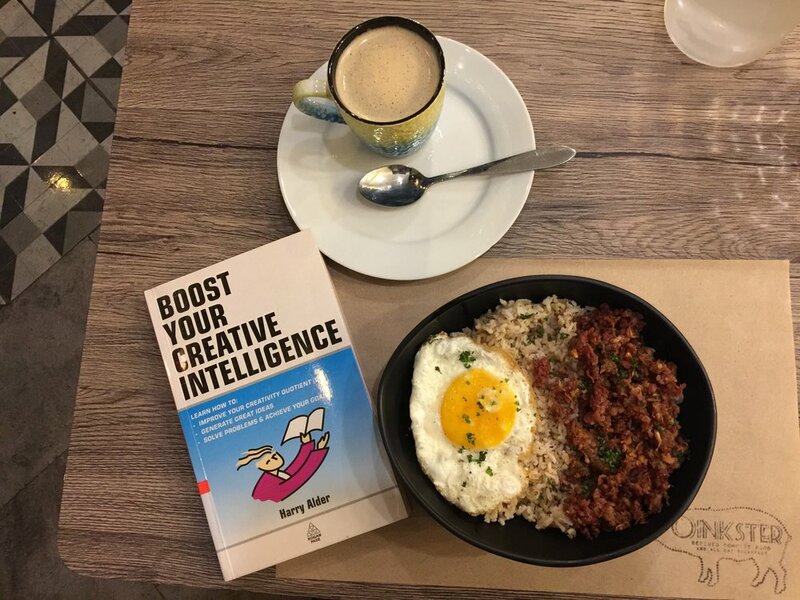 I'm currently reading Boost Your Creative Intelligence by Harry Alder. With a self-explanatory title and a straightforward brekkie, I really couldn't ask for more.